President Barack Obama receiving his flu shot. One of the consistent tropes of the antivaccination cult is that vaccine preventable diseases are not that dangerous, so why take the risk (mostly minor, although not in the cult’s mind) for little benefit. Except for one tiny issue–vaccine preventable diseases kill. Recent studies have shown that an average of approximately 30,000 adults die of these diseases every year, about 95% of the total deaths from vaccine preventable diseases. Researchers at the University of Colorado at Denver surveyed USA physicians regarding adult vaccine delivery. The results and analysis were recently published in the Annals of Internal Medicine. The researchers found that rates for adult vaccination remain quite low. Only 62% of adults above the age of 65 received the pneumococcal vaccine. Only 65% of adults in the same age group received the flu vaccine. This group is at high risk of death from pneumonia and flu, and in fact, deaths from these diseases in this age group, makes up a significant portion of vaccine preventable deaths in this group. The authors noted the Affordable Care Act addresses the cost barrier to vaccination for privately insured patients by requiring insurers to cover recommended vaccines with no co-pay when delivered by in-network providers. Setting aside the embarrassment that the USA doesn’t make vaccines easier to get for those who cannot afford them, it is clear that the low rates of adult vaccination has lead to higher rates of vaccine-preventable illnesses and death. 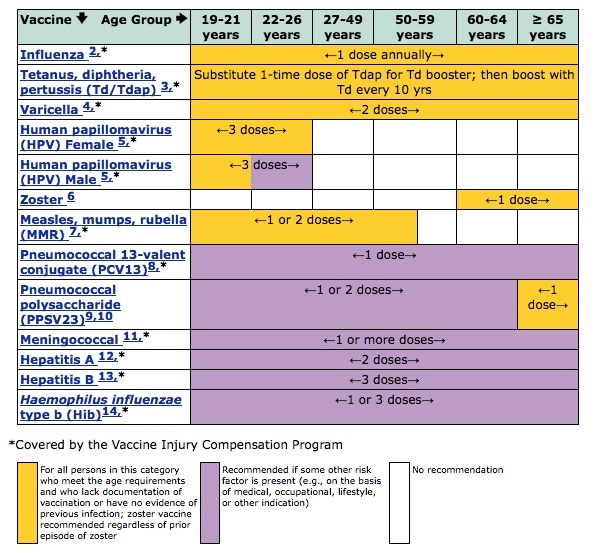 Saving 30,000 lives through proper vaccination and following the new adult vaccine schedule (see figure below) will help reduce that number quickly. ©Centers for Disease Control and Prevention, 2014. Current adult vaccination schedule. Vaccines provide an important but underutilized opportunity to reduce the burden of vaccine-preventable disease among adults. Although primary care physicians appear motivated to ensure that patients are up to date on vaccinations, many barriers exist. Implementation of system changes, including adopting practices that improve communication between primary care physicians and alternate vaccinators, more widespread use of effective tools (IISs and clinic decision support systems), and removing policy-related barriers, could improve adult vaccination in the United States. Vaccines really do save lives. Hurley LP, Bridges CB, Harpaz R, Allison MA, O’Leary ST, Crane LA, Brtnikova M, Stokley S, Beaty BL, Jimenez-Zambrano A, Ahmed F, Hales C, Kempe A. U.S. Physicians’ Perspective of Adult Vaccine Delivery. Annals of Internal Medicine. 2014 Feb;160(3):161-170. DOI:10.7326/M13-2332. National Vaccine Advisory Committee. A pathway to leadership for adult immunization: recommendations of the National Vaccine Advisory Committee: approved by the National Vaccine Advisory Committee on June 14, 2011. Public Health Rep. 2012 Jan-Feb;127 Suppl 1:1-42. PubMed PMID: 22210957; PubMed Central PMCID: PMC3235599.